Ubisoft is hosting a For Honor Halloween event from now until November 8th on all platforms. Adding Halloween-themed items and stages for players to enjoy. 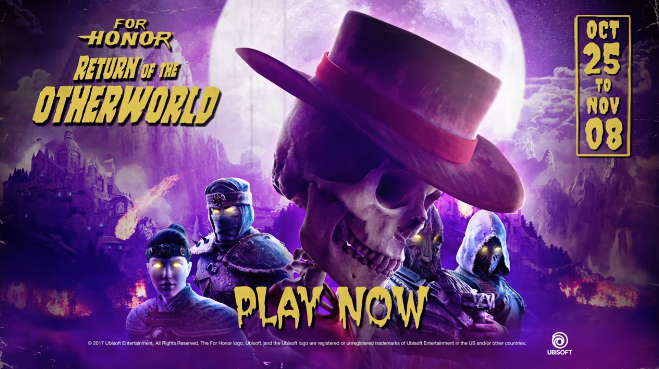 In Return of the Underworld, armies of skeleton warriors will invade in a special mode, challenges, quests, and rewards. A new game mode that players are getting is called Endless March, which is a variation of the 4v4 Dominion Mode, and of course where soldiers appear as skeletons and deal a crazy amount of damage. Recently added Wu Lin alter their appearance with the all-new Mask Outfits along with new lootable items such as the Moonlight Sonata effect. Next week the Jack O'Lantern emote will be added. For Honor is now available for PS4, PC, and Xbox One.